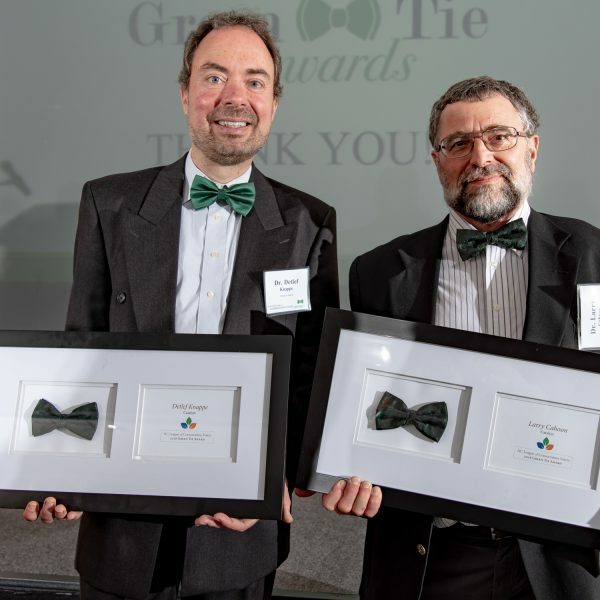 Each Spring the North Carolina League of Conservation Voters hosts their Green Tie Awards banquet to honor environmental champions who have ‘stepped up and spoken out’ on issues with which the organization is involved. Among the honorees this year was CCEE’s Dr. Detlef Knappe, who received The Catalyst Award. The Catalyst Award is presented to an individual who has taken exceptional action to create change and/or bring attention to an important environmental issue. Knappe was recognized for his research which resulted in the identification of a contaminant known as GenX in the drinking water supply affecting more than 200,000 North Carolina residents. GenX is the trade name for an unregulated fluorochemical used in the manufacture of non-stick cookware and water-repellent apparel. A 2016 report issued by Knappe’s reseach group described high levels of GenX in the drinking water supply for the city of Wilmington, North Carolina and surrounding counties located along the Cape Fear river. Further work by his team identified the source of the contaminant and eventually led to regulatory action which stopped the contaminant from being discharged into the waterways. Knappe has been called upon often over the past couple of years by policy makers, regulators, and the media, as an expert on water quality issues in North Carolina. Dr. Detlef Knappe and UNC-Wilmington scientist Dr. Larry Cahoon were honored for their research which detected GenX in the Cape Fear River. Find out more about Knappe’s research and GenX.